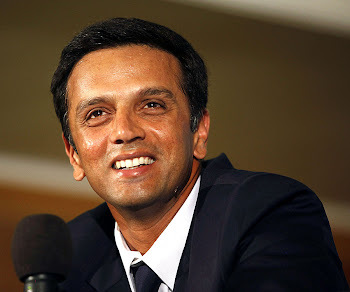 Rahul Dravid: Dhoni ke Dhurandhar! So, now M.S.Dhoni is a happy person.He got the team which he wanted.He had asked for young blood for preparations for Cricket WC 2011 (but one thing he must understand is that he does not deserve a fixed place in Team India). He brought Rohit Sharma,Robin Uthappa,Virender Sehwag,S.Srisanth is his side by dropping Dravid & Ganguly.These youngsters showed the way they play this game of cricket,in 1st ODI against Aussies.They looked impatient whenever they were unable to hit boundaries.They had forgotten the fact that one must stay on the wicket for scoring runs. They were given this opportuinity because they are good fielders,they play aggressive cricket etc.But the fact is that the good fielding is useful iff you have some runs on the scoreboard.You can not turn the game by fielding well after getting all out for score of less than 200 runs,isn't it? Now it is upto the BCCI selectors to wake up and bring back the experienced players like Dravid and Ganguly.If they want to give chance to the youngsters , rotate them. In the team,there must be atleast two members from Golden Trio (Sachin,Dravid,Ganguly).It would be better for Team India.